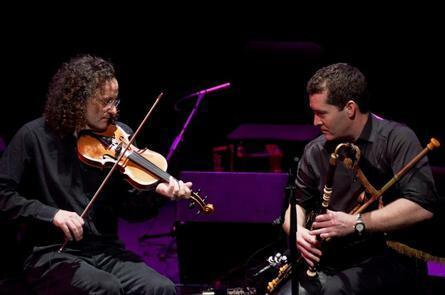 Armagh Pipers Club and the William Kennedy Piping Festival are delighted to present the legendary Martin Hayes in duet with piper David Power. Martin Hayes’ soulful interpretations of traditional Irish music are recognized the world over for their exquisite musicality and irresistible rhythm. He has toured and recorded with guitarist Dennis Cahill for over twenty years, and has collaborated with extraordinary musicians in the classical, folk and contemporary music worlds such as Bill Frisell, Ricky Skaggs, Jordi Savall, Brooklyn Rider and the Irish Chamber Orchestra, RTE Concert Orchestra as well as many of the greatest traditional Irish musicians over the past thirty years. Martin has contributed music, both original and traditional arrangements to modern dance, theatre, film and television. He has performed on stage with Sting and Paul Simon and recently recorded with Yo Yo Ma&apos;s Silk Road Project. He is a founding member of the trailblazing group The Gloaming with whom he has recorded 3 groundbreaking albums and performed everywhere from Carnegie Hall to the Sydney Opera House as well as a record breaking run of 7 nights in the National Concert Hall Dublin.